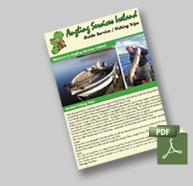 By employing an Angling Services Ireland Guide you make the most of your time and you greatly increase your success rates. Our guides have excellent local knowledge and angling experience. During our guided trips we will bring you to the venues where the fishing is best at the time, taking conditions, weather and your own preferences into consideration. Our trips are designed to be educational as well as enjoyable and of course all about maximising your chances to catch fish. Let us do all the work, while you do the Fishing! During a day’s guided fishing, we will also provide Tuition for those seeking to learn and practice any particular aspects of angling. If you are interested in any particular method or certain aspects of pike fishing, please ask us in advance and we make sure to have the right gear with us on the day. Our Guide service can be booked on a daily basis or as part of one of our Bespoke Angling Package Holidays.